The Trump administration’s top budget and management official told lawmakers on Wednesday he will oversee the punishment of another Cabinet leader found to have violated spending laws, while also promising details on proposed retroactive budget cuts in the coming weeks. Environmental Protection Agency Administrator Scott Pruitt’s unlawful spending to install a soundproof booth in his office is serious, Office of Management and Budget Director Mick Mulvaney told a House appropriations subcommittee, and will be followed up with the penalties as required by law. The Government Accountability Office found this week that Pruitt violated a provision of a 2017 spending bill that required congressional notification for any office refurnishing that exceeded $5,000, and in so doing violated the Antideficiency Act. Mulvaney noted the law is criminal in nature and said he would discuss with OMB’s lawyers what steps to take next. “We’re going to be completely above board on this,” he told the committee. “I’m not any happier about it than you are.” He added the White House may put forward guidance to clarify and add to the existing rules covering what administration officials can spend on their offices, similar to what it did on travel spending. On its website, GAO notes, “Employees may be subject to appropriate administrative discipline including, when circumstances warrant, suspension from duty without pay or removal from office. In addition, employees may also be subject to fines, imprisonment, or both." Rep. Nita Lowey, D-N.Y., the top Democrat on the full Appropriations Committee, said such cuts, if enacted, would cause chaos across government. Mulvaney denied the administration was reneging on an agreement. 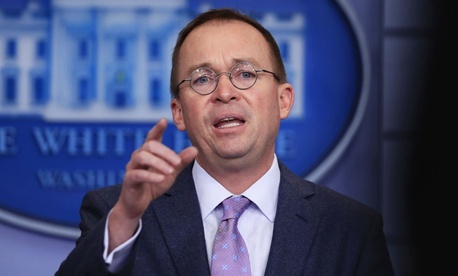 While the director demonstrated a wide knowledge base on an array of issues related to both his OMB job and his role as acting head of the Consumer Financial Protection Bureau, he was clearly thrown for a loop by a line of questioning on a small federal agency. Rep. Mike Quigley, D-Ill., questioned Mulvaney on why the administration was moving forward with closing two of the Federal Labor Relations Authority offices despite a prohibition in the recent omnibus on spending any money to reorganize offices without first consulting with Congress. Mulvaney said he was not just unfamiliar with the plan, but with the entire agency. “Not only am I not familiar with that, I’ve never heard of that,” Mulvaney said of the plan and FLRA generally. The agency is responsible for approving new collective bargaining units, resolving unfair labor practice disputes and reconciling negotiations between unions and management in the federal government. Quigley said closing the regional offices, which has led FLRA to offer relocations to 16 employees, qualifies as a reorganization and therefore requires congressional approval. FLRA currently has seven total regional offices.